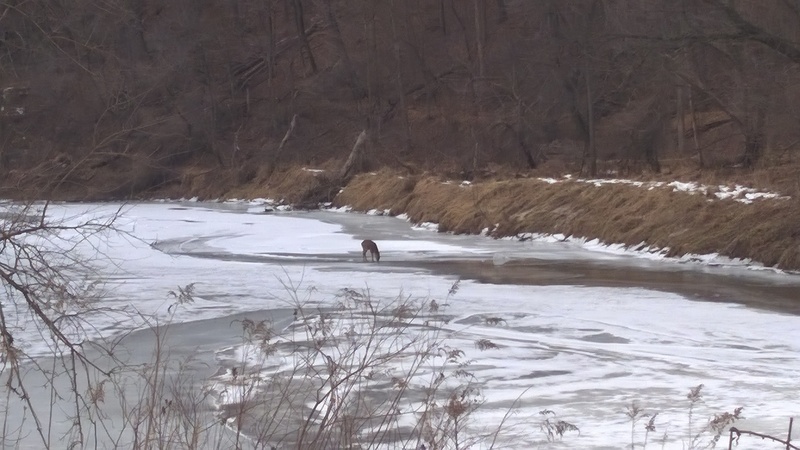 A doe braving the ice on Buffalo Creek to take a drink. Photo by the author. 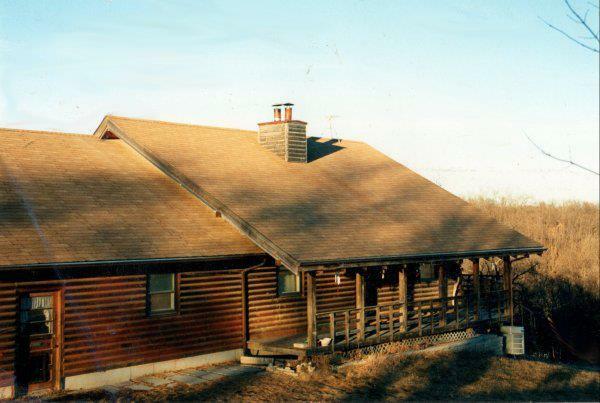 For more than 20 years our family has lived in a log cabin in the Wapsipinicon River Valley. Our small acreage overlooks Buffalo Creek and our neighbors are mostly wildlife and the beautiful woodlands that provide shelter for them. Back when we started, there were few neighbors with most of the large parcels being being held by farmers that valued the land. Fast forward a number of years, and many of the children who were heirs and who inherited those lands from their parents have since divided them up into parcels of less an acre or slightly less. These are being turned into new housing developments. Getting away from all of that is exactly why we came out here. We easily have seen 20 – 30 homes built within the two-mile radius around us in the past 10 years. Of course, having 15 acres of woodland does create a bit of a buffer and most of the time unless we go to the end of our driveway, we don’t even see anyone else. I will say that it is a welcome sight to observe some of the new neighbors practicing some sort of homesteading and sustainability for themselves. Even so, whenever “civilization” begins to close in and encroach on the peace of the place, it’s admittedly difficult not to feel a bit put out. or china marker on each log piece to tell us where each piece went according to the plan. It was early in the fall, so we figured we had time to put most of it together before the first snow flew. It was probably one of the worst Iowa winters in the state’s recorded history. We didn’t just get inches of snow – we got several feet of the stuff. I still remember our family of nine people (no kidding!) living in what would be the basement of the house. We had a fireplace on that level so we were warm but cramped. During that winter, we had to tunnel to get to the barn to feed and water the horses. Our school bus having to go through snow drifts that were between 6 -8 feet high once the county finally dug us out! As for those crayon marks? Yeah, they were definitely gone by the spring thaw. When we could finally start to get serious about getting the actual log part of the home constructed, we had a new set of challenges to meet. After the snow, what we were left with was the architectural and construction plans for a two-story colonial log home and what amounted to a giant jigsaw puzzle. The company that sold us the kit was little or no help in giving us a way to solve that puzzle. To say that it was an exercise in both patience and determination to try and see where things went is a definite understatement. Tempers flared, people screamed, cried and wanted to give up. Thankfully, we had no major mishaps of putting the wrong piece in the wrong place – well not that couldn’t be corrected, that is. In that, I think we were extremely lucky. Let me state at the outset that it was one of the first kit log homes ever marketed so unlikethose sold today,. 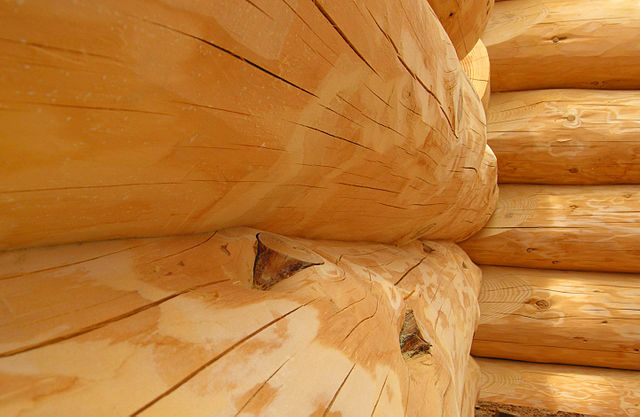 The logs did not really have a tongue and groove between them to aid in construction so the surfaces were mostly flat on top and bottom with rounded sides. A thin strip of foam placed between two logs for “insulation”. Because of this, they needed to definitely be caulked or chinked. The logs were placed one on top of the other and then held in place with 12″ spikes. I still have some of these spikes left overand I keep them as souvenirs. When people see them, they gawk in near-disbelief of what it might have taken to drive one of those monstrous babies through the logs. A sledge hammer and lots of upper arm strength were great for keeping in shape – and definitely served we kids us well in the summer during drum corps season. To be honest, I am not sure how we did it all, but we did. Once erected, my poor brother, Bill, got most of the task of having to apply chinking to the darn thing, especially at the higher elevations. Our parents were nervous about letting my five sisters and myself up so high on the ladders. I was certainly never afraid of heights. Additional problems arose when it was discovered that the specified floor joists or trusses were not large enough to handle the incredible weight of a two story log home. It had only ever been built on paper before we undertook it. Thankfully, my parents and a local architectural firm were able to rig up a steel beam system to help reinforce and stabilize the home. The Log Cabin in the Enchanted Forest. Photo by the author. The years passed, and through living on the West Coast for a time, my spouse and I found the absolute perfect home for us. It was a log home, also from a kit, but properly constructed by a little old man who had been in the Navy during World War II. The old gentleman, who very resembled the dwarf, Doc, from Snow White, had hand-built the cabinetry inside. He had added all kinds of touches, details and conveniences that he wanted. But it had become, as he put it, just too much for him to take care of at his age – and he wanted to be closer to the Iowa Hawkeye games. This modest, two bedroom house with a full basement had a heat pump and a primary heat source that ws a forced-air wood burning furnace. As wondeful as all of the home’s amenties were to us, to be honest, we fell madly in love with the land before we fell in love with the house. The land was 15 acres and wooded and nestled strategically on one of the highest hills in our county. During storms, it was built-in such a way to be sheltered from the storm and high enough from the flood plain below that there was little to no chance of ever being flooded. There were fruit trees, walnut trees, large sweeping Norway and Blue Spruce, comfrey beds and other raised beds. The owner had cut an access road through the property that led down between steep limestone cliffs with a couple of actual caves that could be accessed. At the bottom of the road. to a beach area that crossed a little side creek with a couple of still pools that you could occassionally see small fish. Across the creek was an “island” that we were told half of belonged to what was be our property. There was no question for us. We had found the perfect homestead, and we wanted this property and were determined to get it. We even sold our own home in town out from under ourselves before the banks got all the kinks of the transaction ironed out. There was even one point where we slept on the stone floor of a friend’s basement curled up next to their wood stove and were “homeless” for a week and a half. At the time, my spouse and I both had full times jobs and a four-year-old son. There were lots of tears of frustration and calls trying to get things finalized and manage it all. In the first week of November of that year, when the deal was finally done, money changed hands and we were handed the keys, I can say without hesitation that it was all worth it. unlimited pool of funds to buy all the “stuff” you think you need, you can quickly talk yourself out of any notion of even starting. It doesn’t have to be a big thing. If, for example, you find a wonderful terra cotta or other type of bread pan at the thrift store, go to a library to find some recipes or look online, then start assembling your ingredients. You don’t have to spend a lot. Flour and yeast are fairly inexpensive. 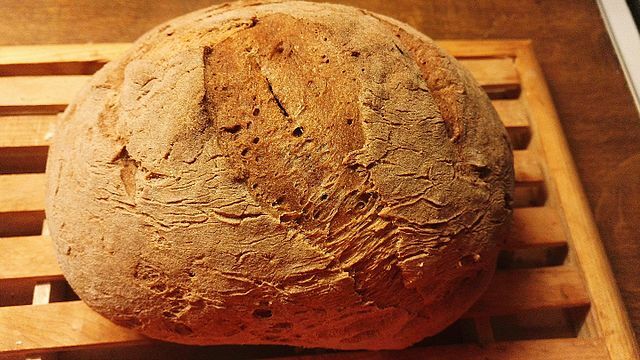 If you have access to a big mixing bowl and an oven, I promise, homemade bread can definitely be in your future! Homesteading is really just about getting your hands in it and doing it for yourself. There are lots of things that are hands-in or hands on, and over time, you build up a set of skills that you didn’t have before. I will be honest when I say that this blog is not about ‘prepping’ for a real or imagined doomsday. I was in the Girl Scouts all the while I was growing up, and the motto of “Be Prepared” was hammered into each of us from the beginning. I do agree that being prepared for any situation and having emergency rations and provisions is important. Putting food by through canning, drying or cold storage were things that our ancestors did. It was good common sense to have available food, water and provisions if an emergency would come up and it was a smart way to get through the lean months of the year when food wasn’t readily available. I also agree that in the case of climate change and the marked increase of large-scale natural disasaters, it is important for people get themselves and their families to safety. However, some of the blogs that I have read like to push the fear factor with their readership and that just isn’t my experience nor do I plan to make it my focus. My goal for this blog is empowerment by helping folks realize that no matter where they are, they can be more self-reliant – immediately! Just by using what they have available, or can barter or trade for or make themselves. There are few things more satisfying than doing or making something with your own hands – especially if it’s something you need, or something you will be using every day. I will be sharing the things that I know, research and resources I have found and interviewing others who also have opted for this way of life. Please feel free to comment, here in the comments area, or you can reach me on social media. I am on Facebook, Twitter and Pinterest. Just look for my nickname of Fanny Fae, or my Kemetic name of NiankhSekhmet on Instagram. Please reach out and say, “Hello!” I ‘d be really excited to hear from you! Next Post Homesteading Resources to Help You Get Started Wherever You Are – RIGHT NOW!